come out seeming to be best thing since sliced bread and we here at Crisis Application Group are here to help you make an educated decision in what you choose to purchase because this purchase may be used to save somebody's life. Every tourniquet has its Pro's and Con's that can and should be mitigated by rigorous training. When the human factor is eliminated as best it can through rigorous training, THEN we can talk about proper equipment. It doesn't matter if you have the best tourniquet in the market if you can't use it properly. Cutting right to the chase: I'm not sold on the R.A.T. Tourniquet just yet. (Pictured:) it has "TCCC" approved on it, which is not the military's official "CoTCCC" which Crisis Application Group's CEO was formerly a member of. That could be misleading to many folks that think it has been approved for battlefield use. 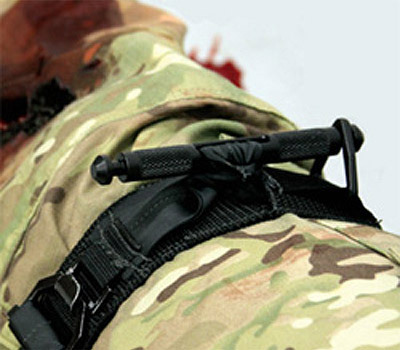 The RAT tourniquet is a flat bungee that works through wrapping the cord around the extremity to stop bleeding. While you could improvise many items to slow the bleeding, I expect total arterial occlusion from a commercial product. I have yet to see Doppler prove that it occluded arterial blood flow, studies on live tissue, or real CoTCCC approval. The RAT tourniquet page has video documenting it stopping the pulse through the use of a Pulse Oximeter, but that is not where the bar is set. I see the temptation with the lower cost and size, but in medicine you can't take the "idea" over proven effectiveness. In the game of saving a life, you may have to spend the extra dollar. CAG Tier 1 Med Packs! Complete modular systems $99! There is also the argument about proper width, which is directly correlated to soft tissue damage and more importantly arterial occlusion. It states and is 1.5" when properly applied, which I will give them the benefit of the doubt. However, with items used in a high stress environment, you'll want a redundant product that is less likely to be messed up. For instance, if there is too much spacing between the wraps, or overlapping too much could require the Operator to re-do the intervention, releasing the tourniquets pressure. In addition, Some ha ve argued about the length of RAT tourniquet on a thigh, but after seeing a video demonstrates it's use on a 26" thigh properly, I have no complaints there. A large portion of the reviews say it's fast enough than taking an already 'looped' CAT from the foot of the patient and jostling it all the way up. I teach my TCCC students the option for a CAT to instead be applied through the friction adapter at the correct height of the limb. This requires less movement and going around the limb than the multiple loops of the RAT. A tourniquet isn't just about putting one on, but keeping it on. I would like to see how it would hold up in casualty drags and carries, where rocks, debris and gear can cause a tourniquet to possible become loose and therefore less effective. If we received one in the mail, we'd surely test it out further. Until then, we'll wait till we see more concrete proof. This is the SWAT-Tourniquet. It's name is also how to use it: "Stretch, Wrap and Tuck." . 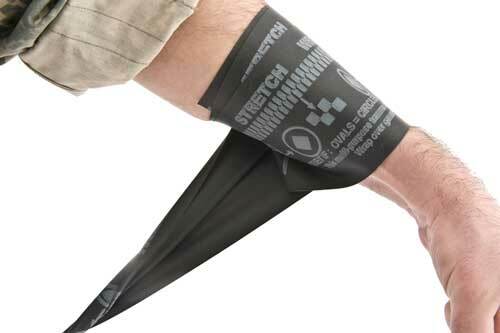 It's an elastic wrap, I've used one in practice when I came across it. It was very strenuous to get working and after application to the legs and I put it on aggressive and tight. In addition, when finished wrapping, you have to find a place to tuck the tail into or it will unwrap itself, which was one of the largest issues I had. I would mention the pain, but that has no room in saving a life because "The Operator feels no pain (when doing medical interventions.)" 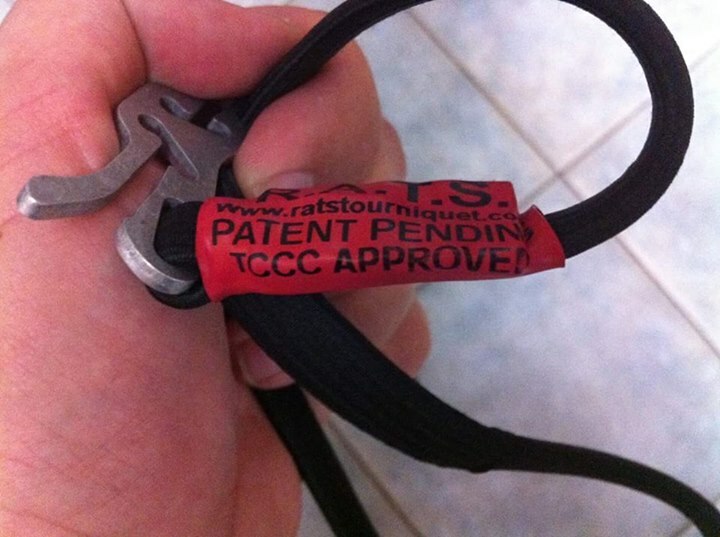 I would not recommend this product that is not CoTCCC approved and many units do not allow it. 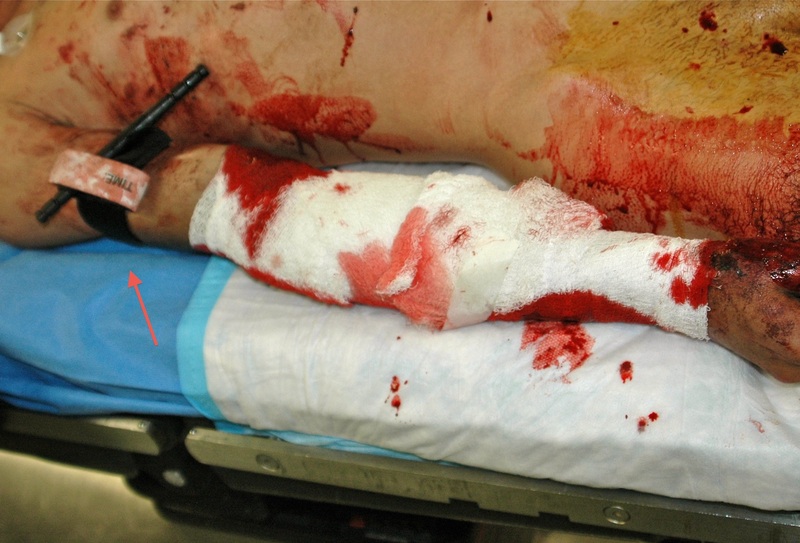 I wouldn't even use it as a pressure dressing to avoid compartment syndrome, and an ACE wrap is easier to see blood leaking through if your intervention fails. 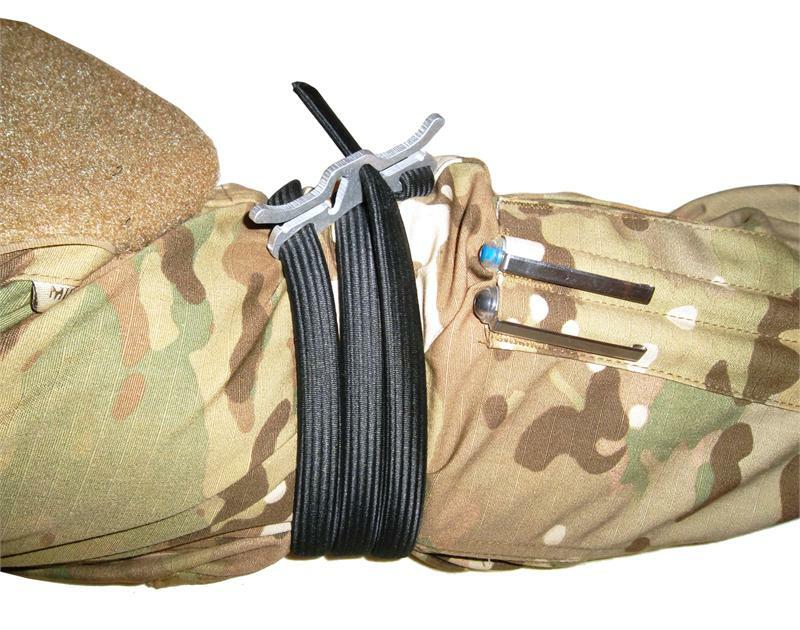 The two tourniquets widely used in the the Special Operations community as well as experience in the staff here at C.A.G., but even more importantly have approval from the Committee on TCCC (CoTCCC) and Fort Sam Houston's Institute of Surgical Research are the Combat Application Tourniquet, version 3 -or- CAT3 and Special Operations Forces Tactical Tourniquet -or- SOFT-T/SOF-T. The CAT3 has been ol' faithful for quite some time. It does get a lot of hate, though, and as someone who has taught all different groups of people TCCC, I can see where it frustrates newcomers. 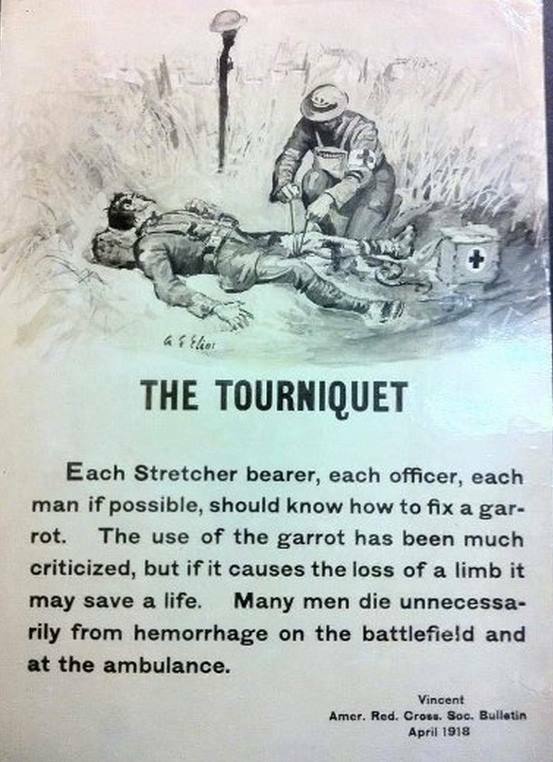 Just like many other good pieces of equipment, a tourniquet is not a learn-once and done. The CAT3 needs some practice to get down smoothly, especially with the friction adapter. C.A.G. has a video you can watch to learn how to do it right and practice in order to stay under the goal time of 30 seconds. ** A CAT3 once used for training or any other purpose should not be used in trauma. SOFT-T: Special Operations Forces - Tourniquet is another tourniquet we recommend, but just as with the CAT, it will take practice to get it right. 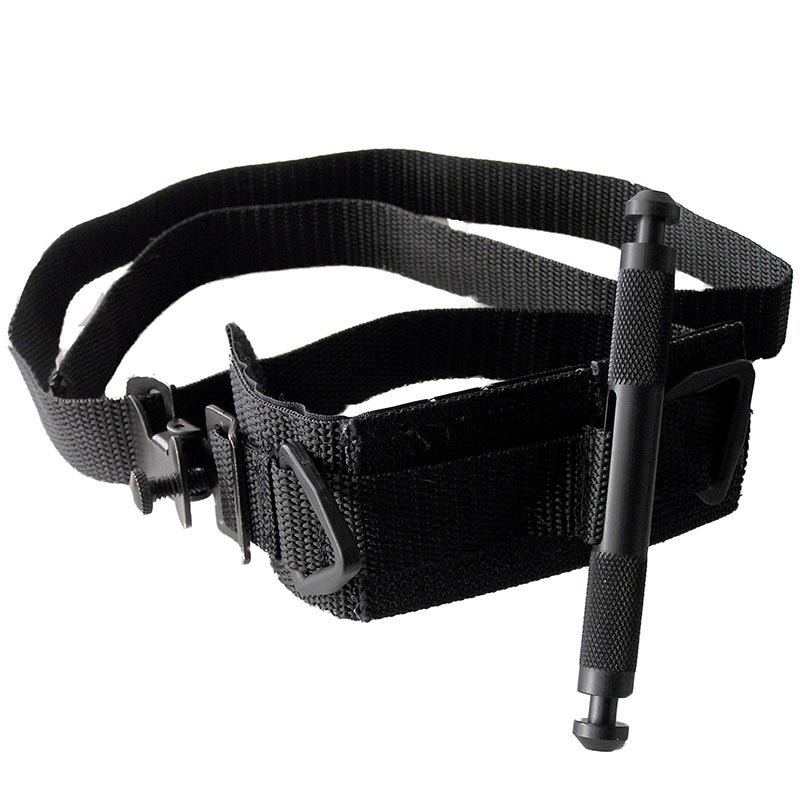 If you foresee you or others in your group having a hassle with the tightness of the screw or remembering it, the newest generation SOFT-T has a buckle that makes life easier. 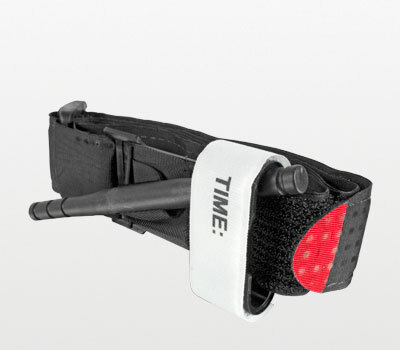 LEFT: SOFT-T RIGHT: Newer SOFT-TW Wide with Buckle in place of the screw. Improvised Tourniquets are as their name implies, using what you have available in an attempt to create a tourniquet effect. They are good to know how to make and have prepared for an austere or mass casualty incident where you do not have one, or do not have enough tourniquets. However, they do not work as well as commercially designed tourniquets, so prepare a few in case you run out and tuck it away in your intellectual equity toolbox. Our very own Crisis Application Group's Jay Paisley demonstrates just how simple it can be. What I hope you take away from this article is to be skeptical of new inventions proclaiming to be the next big thing, especially in the business of saving lives. I could go over every possible tourniquet on the market and write a book but I'm sure you got the point. When you come across one you're unsure about, do some research or even feel free to ask us about it. Inspect your tourniquets as you receive them, as some have cheap after-market knock offs made of cheaper, flimsy products or even an older generation of what's currently best. I also recommend you take your tourniquets out of the packaging and prepare them properly as fumbling around with that can cost a few extra seconds when the goal is preserving "fresh clean blood." CAG Class: Intro to Austere Field Medicine, Conyers, GA! "READY - SURE - SECURE"
When Do We Apply the TQ "High and Tight?" What is the first Antibiotic, or even Medication, that one should stockpile for Survival? Seven members of the radical Muslim group National Thowfeek Jamaath killed at least 290 people on Easter Sunday, Sri Lankan officials said. A van owner thought he parked his vehicle in an ideal spot to take a stroll but mother nature had other intentions. A ranger at a national park in Congo captured a selfie as two female gorillas appear to pose in the background, and the internet is loving it. Shir Katzenell left a prestigious position in the Israeli army to pursue pursue a childhood dream: becoming a mermaid. 05-06-2017 Hits:5233 Uncategorized Richard W.
05-06-2017 Hits:6228 Uncategorized Richard W.